This page provides the information needed to upgrade an existing APPX 4.2.a Windows installation to APPX 5. Warning - These instructions specifically apply to upgrading from APPX 4.2.a to APPX 5. If you are upgrading from an older release of APPX you must upgrade to APPX 4.2.a first and then upgrade to APPX 5. Verify the integrity of all files in your system and correct any errors. Each file should have a status of OK, or Skipped: Temporary or Non-indexed File. 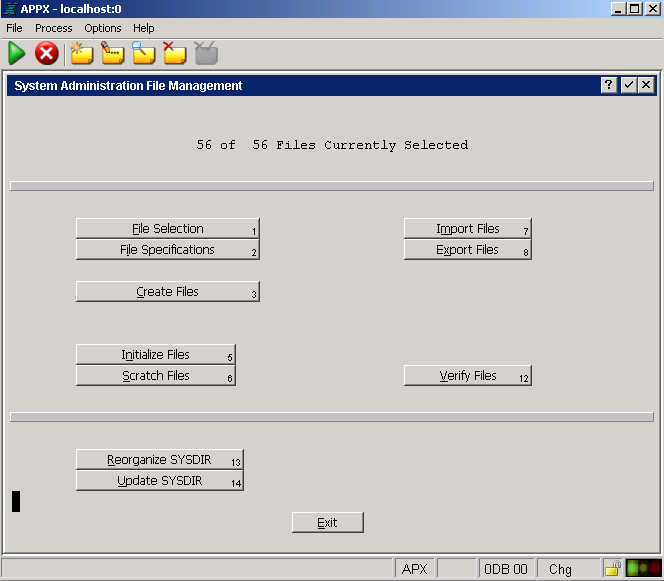 System Administration (Option 3) > Database/Applications (Option 3) > Design File Management (Option 5) > Enter the Application and Version number for each application that you want upgraded to APPX 5 > Select all files > Verify Files (Option 12) > Verify Integrity of APPXIO Files (Option 1) Should be on a file system path similar to \Appx\data\00\TGL\Data\*. Look for failures. Skips are okay. 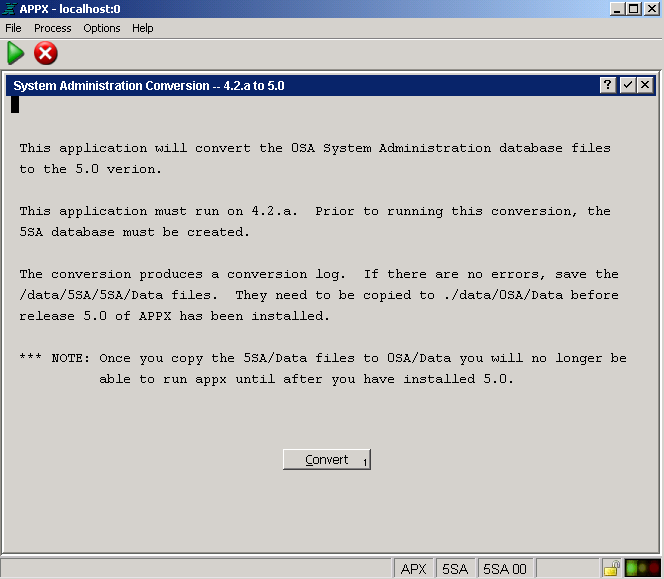 The first step of upgrading your APPX 4.2.a installation to APPX 5 is to convert your System Administration files to the new APPX 5 format. The System Administration files for APPX 4.2.a are not compatible with APPX 5 and must be converted to the APPX 5 format. Follow the directions below to convert your System Administration files. Two different methods are provided to install the upgrade application on Windows. There is a GUI installer and a Console Mode (character mode) installer. Most sites will use the GUI Installer, the character mode installer is intended for sites using Windows Core Server (Windows without a GUI). The same installer is used for both methods. The installer will automatically detect if it is being run as a command or from a GUI Desktop, although in some cases you may have to add "-c" to the command line to force the character installer. Regardless of which installation method is used, the result is the same. Log in to your system as an administrative user. Download and run the installer for the APPX 4.2.a to APPX 5 upgrade application Appx4to5upgrade-windows.exe from the APPX web site or the APPX ftp server. After a few moments, the APPX 4.2 to 5.0 Upgrade Application Setup Wizard should display the Welcome screen. Click on the "Next" button to continue. Specify the Destination Directory into which the upgrade utility is to be installed. The directory that you specify must be the directory where APPX 4.2.a is installed on your system. If you don't have access to a GUI, you can run the this installer i">">">n character mode by appending "-c" to the command line. After a few moments, the Appx Setup Wizard should display the Welcome message. Press Enter to continue the installation. 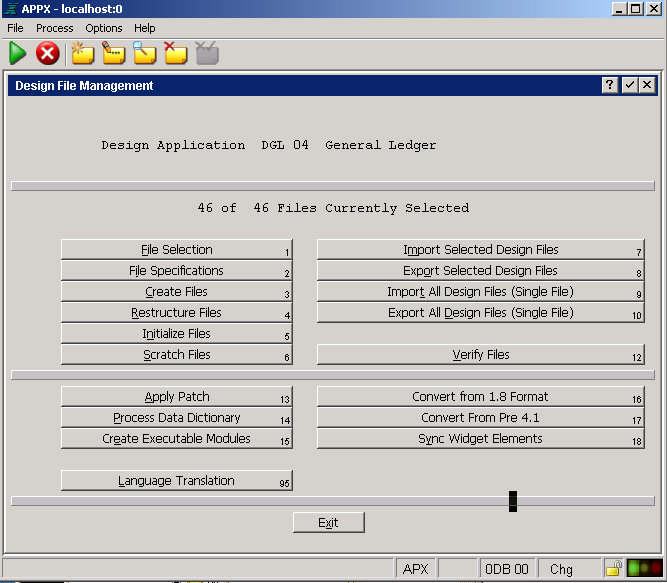 Create the Design Files for Application 5SA. Run an Application (Option 1). 5SA. Before you install the APPX Utility, you must first replace your old System Administration files with the new System Administration files that were created when you ran the upgrade utility to convert your System Administration files to the new APPX 5.0.0 structure. 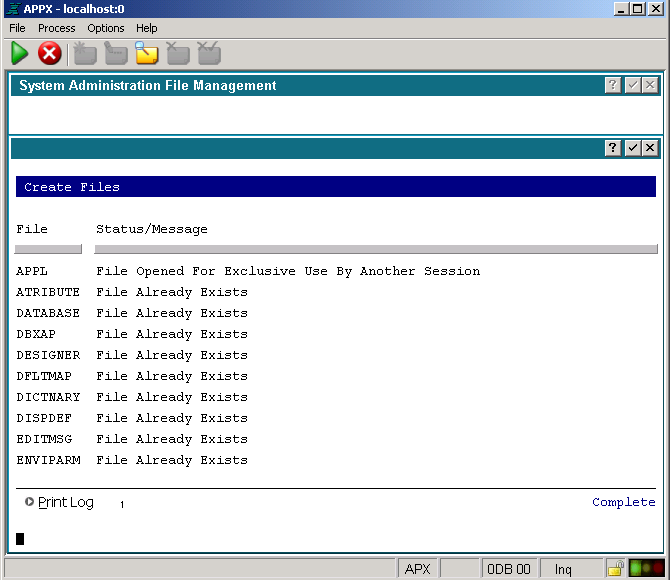 You can use a copy command similar to the example below to replace your old System Administration with the upgraded files. Be sure to edit the copy command to reference the directory where APPX is installed on your system if APPX is not installed in "C:\Appx"
If you are prompted to overwrite any files answer Yes or All. You should also remove the System Administration structure files. You can use a delete command similar to the example below to remove your System Administration structure files. Be sure to edit the command to reference the directory where APPX is installed on your system if APPX is not installed in "C:\Appx". Stop the APPX Connection Manager service(s). Download and run the APPX GUI installer (appxsetup-windows.exe) from the APPX web site or the APPX ftp server. After a few moments, the APPX Setup Wizard should display the Welcome screen. Click on the "Next" button to continue. If you are presented with a Security Warning dialog, click on the "Run" button to continue with the installation. Specify the Destination Directory into which APPX is to be installed. As a matter of convention, APPX is usually installed into C:\appx but may be installed into the drive and directory of your choice, but do not choose a directory with spaces in the name. The APPX Setup Wizard can optionally create a Start Menu. You must specify the appropriate options. If you don't know what to specify on this screen, simply accept the recommended options by clicking on the "Next" button to proceed with the installation. Finally, you may specify whether or not you want the APPX Setup Wizard to create a shortcut on your desktop and/or a quick launch icon on the taskbar. After specifying the appropriate options, click on the "Finish" button to end the APPX Setup Wizard. If you are running Windows Core Server, you can run the Appx installer in character mode by appending "-c" to the command line. After a few moments, the Appx Setup Wizard should display the Welcome message. Press Enter to continue the installation. Double click the C:\Appx\AppxDesktopClient.exe file to start the Appx Desktop Client. 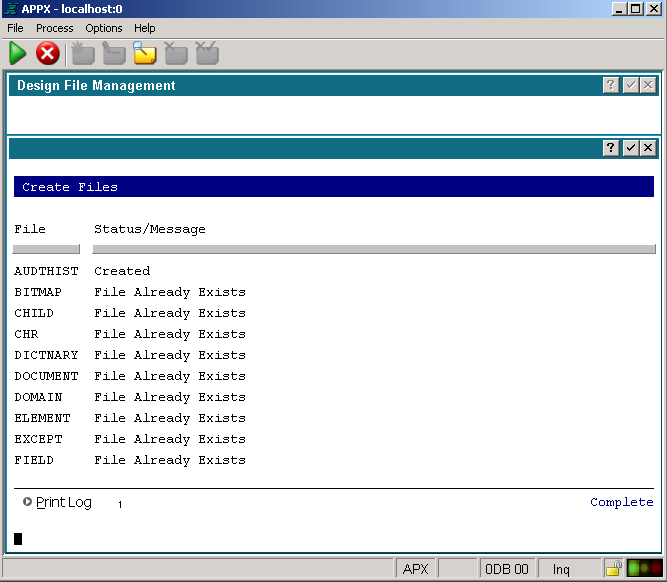 Click on the 'Local' tab, enter the location of the APPX engine (the appx.exe file) and click the connect button. You should be presented with the following System Registration screen. Notice that the Effective Date field on this registration is blank. Starting with APPX 5.0.0, all License Keys include an Effective Date. You must install an updated License Key before you will be able to run APPX 5.x. Note that in Release 5 and higher you can copy your registration to the clipboard, and APPX will detect it when you choose "Typical Import" from the "Import Menu" below. After executing the above command, users should be able to use the APPX 5.0.0 Desktop Client to successfully login on port 8060. For additional information on managing APPX Login Services, please refer to the complete documentation. System Administration (Option 3), System Setup (Option 1), System Administration File Management (Option 2), Update SYSDIR (Option 14). System Administration (Option 3), Database / Applications (Option 3), Design File Management (Option 5). 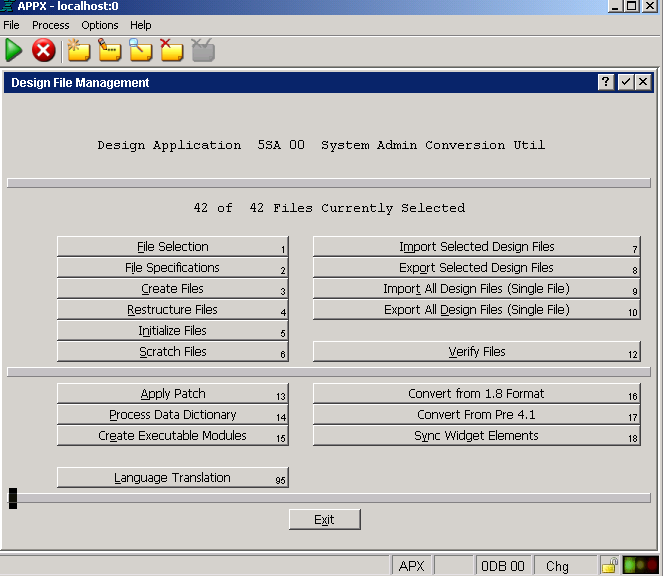 Specify your Application and Version, Create Files (Option 3). If you are using Custom Fonts in your applications (i.e., bar codes, etc) and you have not already updated your Resources for the new method, follow these steps, otherwise they will not print. If you were using Appx/ODBC, you must install the new version. The old version is not compatible with Release 5 and will not work. See this page for installation instructions.